Yaz the Spaz is an American vlogger who helps regular hijabis learn new hijabi styles. This post is late, and for that I apologize! I started it on Friday, but it needed time and some love. I hope you like it regardless! Salaam my lovelies! Jumah mubarak to you all! Friday is when I do my Follow Friday post, which features a hijabi with amazing style on Instagram. Today’s post features one of my favorite vloggers: Yaz the Spaz! 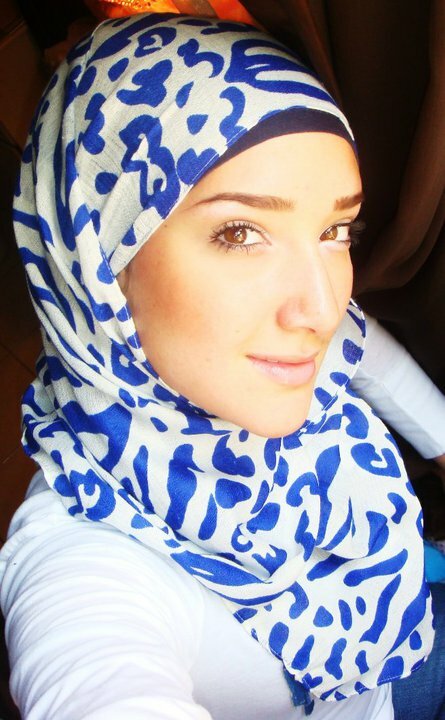 For those of you who don’t know, Yaz the Spaz (Yasemin Kanar) is a popular YouTube hijabi. She started her channel with hijabi tutorials but has expanded to other social media channels as well. She has an Instagram account @yazthespaz89 that follows her on those social media journeys and is just as fun and bubbly as she is. Her Instagram account not only features her daily hijabi style, it also features her friends and family. Hijabis can get a sneak peek at Yaz the Spaz’ baby sister Aysun Kanar’s style, her friends, and even her mom who she affectionately calls Momma Spaz. Her account also serves as fitness inspiration for hijabis. She features her healthy breakfasts, and what she does to work out and maintain her healthy physique. For my readers of mixed heritage, you will be glad to see that Yaz the Spaz embraces both her Cuban and her Turkish roots often. It shows us all the beauty in the diversity of our deen. Make sure to check out Yaz the Spaz and let me know what you think! Salaams my lovelies! I hope you are having a great week. With the Bay Area heating up to almost summer temperature, I really can’t complain. However, when it comes to what to wear, I never know quite what to wear. I want to look nice, but I also want to be comfortable too. I always end up in jeans or a maxi skirt, but I always feel too hot in jeans with this nice California weather and maxi skirts get annoying because most of mine need a lining. I just want a piece of clothing that I can slip on and go and do my thing! Luckily for me, Abaya Addict has the perfect pieces that look stylish, but are made with comfort in mind. I ordered the Solidify Abaya in Caramel in a Medium size. I wish I could say more about the shipping, but I think I had the unlucky timing to order my items when the force behind Abaya Addict was ready to deliver her baby! I will say that the customer service is superb because even though I had a few ordering issues, once they realized my items had not shipped, they just shipped it along with extra scarves! I had originally ordered a Solidify in Denim, but that piece was no longer available so they asked me to pick another one. I am glad when it came because it fit well. It was modest, well tailored and can be dressed up or down. I dressed my abaya up with a sparkly belt when I headed out to halaqa last week. All the ladies kept asking me where I got my abaya from. Thank you Abaya Addict! I also like how I can wear this to my office and make it a part of my work wardrobe. I would just throw a blazer on top. It literally is a piece you can wear a million ways and if you feel lazy like I do sometimes, you can just throw it on by itself and go. I wore one of Abaya Addict’s hijabs yesterday in the California heat and it was so lightweight that I didn’t get my usual headaches from the heat. Plus, the print was so festive that everyone in my office stopped and commented on how nice the hijab looked too. 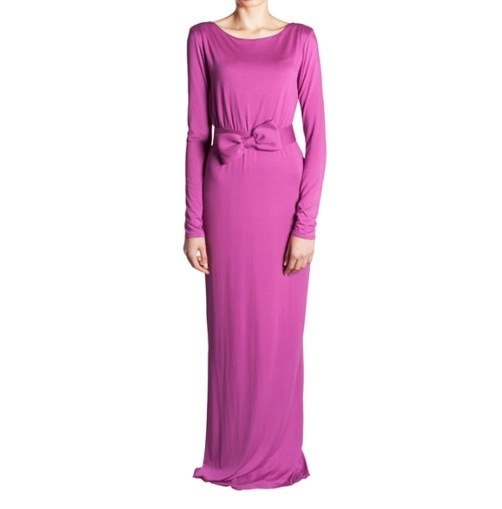 This online shopping destination is one that any stylish hijabi should visit. Once you do, let me know what you think. Dina Toki-o has a funny sense of humor, but is stunning in her high fashion ensembles. Jumah mubarak my lovelies! I know today is a tough and somber Friday. I promise to write a post with some gravity soon. However, I wanted to brighten up your spirits with a very funny and very colorful hijabi that you should follow on Instagram. Known as Dina Toki-o to her fans, her Instagram handle is @dinatokio. Her actual name is Dina Torkia. She is biracial with an English mother and an Egyptian father. While some hijabi fashionistas are more serious, Dina pokes fun at herself and uses endearing terms like “bideo” and “blang blaang” to sort of poke fun at slang we all know and use. While some hijabis may find her too irreverent, I think some of her hijabi extremes actually translates to striking ways to wear hijab. I sort of view her style as the Vogue extreme. While it looks stunning, it may not work for most women but can be translated into something wearable for the rest of us. She has a background in fashion and really started putting a focus on hijabi fashion after she did some coursework in textiles. No wonder she knows how to mix her fabric textures so well mashallah! Regardless of what you think, I still think her Instagram snaps are just so visually appealing that even if you don’t like her style, you will still smile. Let me know what you think! As always, you can follow me @hijabilife. As a hijabi, it can be challenging to find stylish modest clothing. Most chains carry maxi skirts or dresses, but they are either see through or have no sleeves. Well the great thing about social media is that we can find online hijabi friendly clothing. One line that is particularly stunning is Shop Rayan. I ordered their Minna dress shortly after Fashion Fighting Famine. I will say that even though their line is not low priced, buying one of their dresses is far better than my wasting money on lots of stuff from the mall. The stitching and the bow belt really made the Minna dress pop! I will warn my curvy hijabi readers to order a size up because I ordered a size small and it fit every where but my bust! Next time, I will make sure to order a size up though so I can rock some more Shop Rayan soon inshallah. There are so many thoughts that are running through my head right now. As a social media professional, I am blessed to learn things as they happen, but that is also a curse. It means you are the first to learn when bad things happen. At first, you hope it’s a mistake. You then pray please let it be an accident. That it was a technical malfunction. When you slowly realize it is not a mistake or accident, you then find yourself wishing and praying for it to NOT be a Muslim. Please, don’t be a Muslim. Here is the thing. 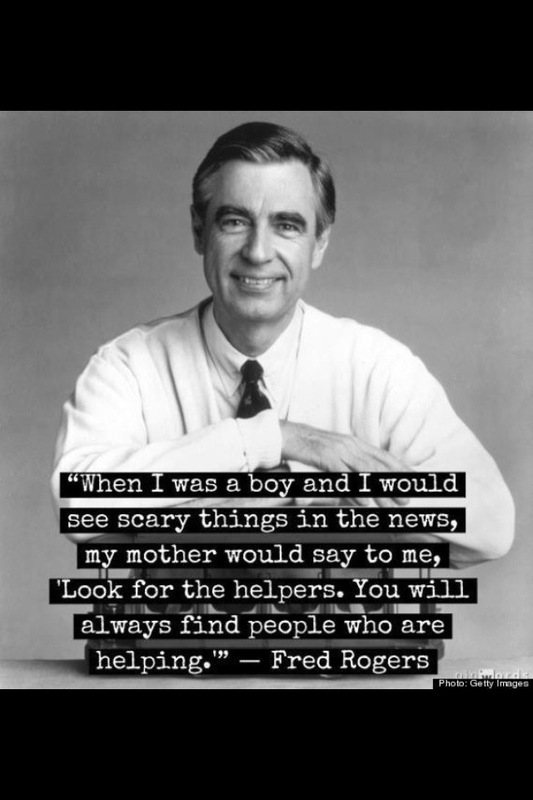 No matter who did it, people still got hurt in Boston today. We have to let people grieve over what happened at the Boston Marathon. This is NOT the time to get on a soapbox and start quoting casualties in other countries. What we as Muslims should be doing is going out and being helpers. We even have an example in the Sunnah of the Prophet (saws). They are called the Ansar (helpers). They helped early Muslims who migrated to Medina. How did they help? They opened their homes, they offered jobs, they did what ever was necessary to help in order to promote brotherhood. When I go to a masjid, I often see only one or two brothers or sisters helping with clean up after an event. Why is that? We should all be running to help because it is just one more way we can attain Allah’s (swt) mercy. Where is that sense of being a helper in our Ummah? Let us be the first to open our homes, help clear up the debris, donate blood and help promote brotherhood with ALL our American brothers and sisters. We have been far too insular for far too long. 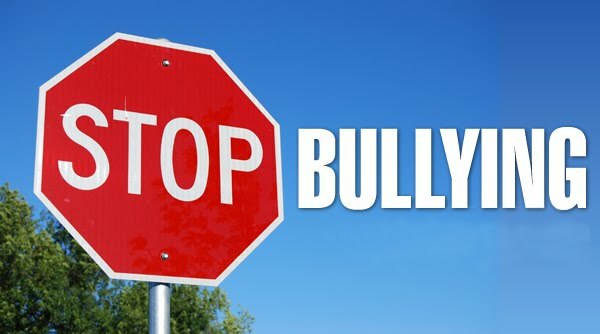 Let us rise up and be a collective part of this community. Let us embrace our heritage as helpers. Salaams my lovelies! For all of you ladies who want to feel as good as you look, you can actually shop for a cause now. Fashion Fighting Famine has partnered up with some of the most amazing hijabi friendly designers around to offer you discounts and have a portion of of your purchase help New Star Family Center. How can you not love that? Fashion Fighting Famine had a fabulous fashion show in Irvine, CA on March 31, 2013. If you missed it, check out their Instagram account @fashionfightingfamine for behind the scenes pictures. They invited the fabulous Amena Khan from Pearl Daisy, Yasemine from Yaz the Spaz, Winnie Detwa, Nura of BabyLailaLov and Imaan Ali of The Hijablog. Even though I live in California, I missed it and while I feel just awful about that, I will try to make it next year inshallah! At least those of us who missed the show can at least shop the show and look great for our future special events. Here is a list of all of the designers who are featured in the Fashion Fighting Famine Shop for a Cause. Visit http://www.abayaaddict.com to see products, email your order to info@abayaaddict.com, and mention FFF in your email. Visit http://hijabhouseonline.com.au, email orders to sales@hijabhouseonline.com.au, and mention FFF in your email. Shop at http://www.inayahcollection.com and enter FFF in the reference field upon checkout. Shop at http://coutureswimnsport.com and mention FFF in special instructions upon checkout. Shop at http://www.mohajababes.com and enter promo code “FFF2013” at checkout. Free shipping from the UK! Visit http://www.nisaaboutique.com, email orders to nisaa.info@gmail.com, and mention FFF in your email. 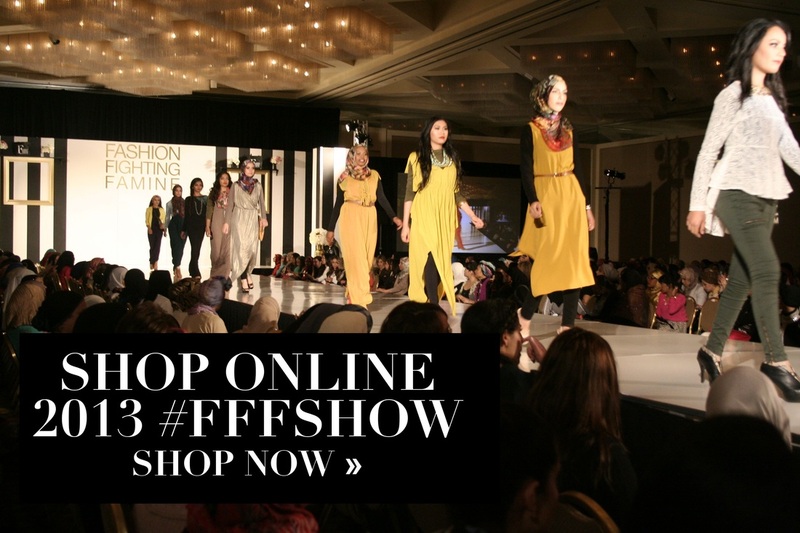 Shop at http://www.shoprayan.com and enter promo code “FFF2013” at checkout. Visit http://www.sixteenr.com and enter promo code “FFF2013” at checkout. Visit http://www.simplyzeena.com, email orders to customerservice@simplyzeena.com, and mention FFF in your email. Happy shopping! I will be updating the blog with reviews for a few of these designers soon inshallah, but let me know what you think I should buy!